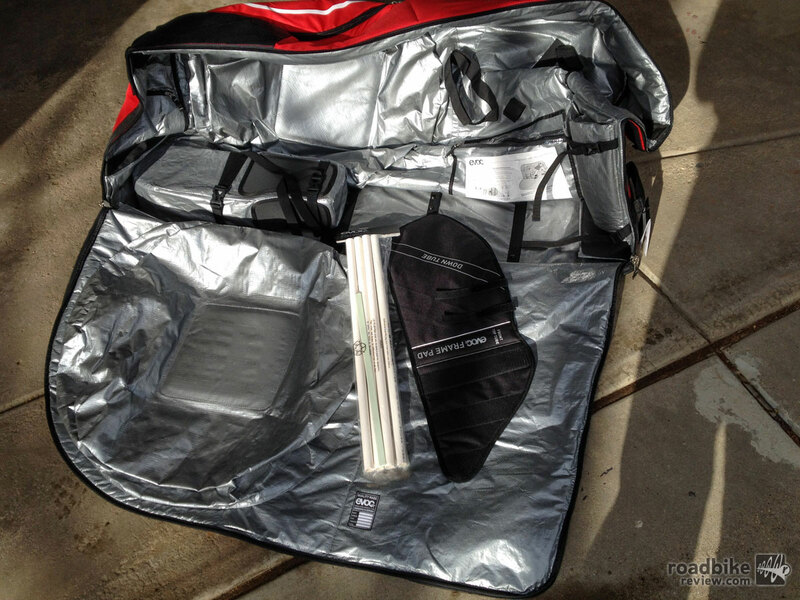 Once familiarized, the EVOC Bike Travel Bag takes about 20 minutes to pack. Editor’s Note: This review was conducted by Mavic communication manager Zack Vestal, who is based in Colorado but makes frequent trips to company HQ in France and elsewhere around the globe. On average, Vestal travels with a bike every 6-8 weeks, which means he has plenty of experience with what works — and what doesn’t — when it comes to flying the most precious of two-wheeled possessions. 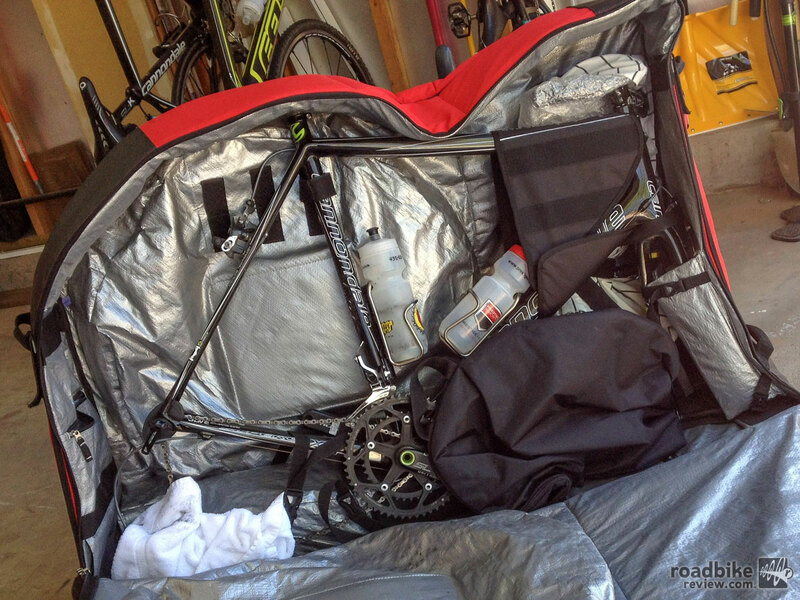 Here are Vestal’s thoughts on the EVOC Bike Travel Bag, as well as some insight on how to pack your bike for flight no matter which travel case you use. I travel a lot — and I travel with a bike a lot. Heretofore my go-to bike case was a Pika Packworks, which weighs 12 pounds empty, folds to a compact size when not in use, and is easy to pack. It works especially well with road bikes, especially light ones such as my 14-pound 58cm Cannondale HiMod EVO. Fully packed, the Pika weighs only about 42 pounds, and because it only has a shoulder strap (giving it the appearance of a tall, flat duffel bag) sometimes you can sneak through without paying extra baggage fees. The Pika’s downside is that it’s pretty small, so fitting a mountain bike is tough if not impossible. Also it does not have wheels, just the shoulder strap. So it’s not great for long airport terminal hikes. It’s for these reasons I was intrigued by the Evoc Bike Travel Bag, which like the Pika is a soft side case, but unlike the Pika, has wheels. 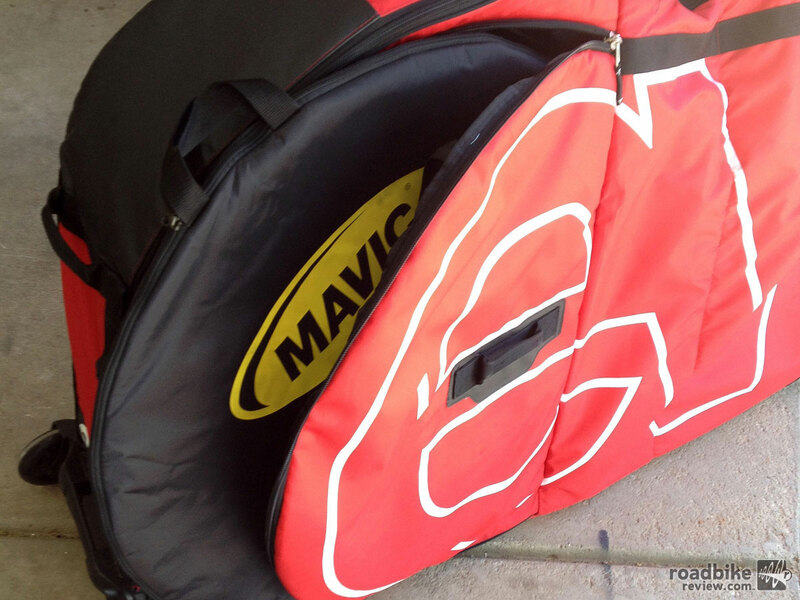 Generally speaking soft side bike cases are more accommodating of varying bike shapes, more forgiving when (carefully) jammed into a rental car, and lighter, making it easier to stay under the 50-pound mark. The downside is that you have to pack carefully if you want your bike to arrive unscathed. 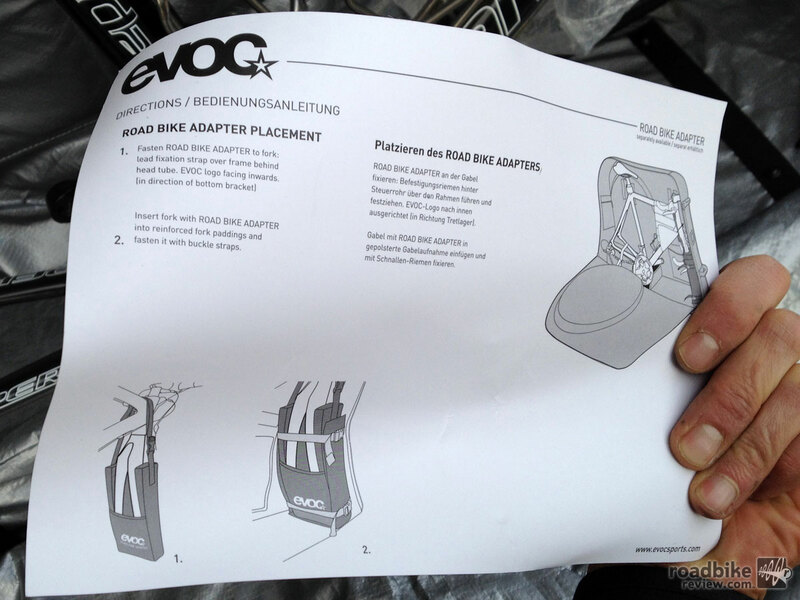 The EVOC case requires some initial assembly, but the included instructions are clear and easy to follow. On a recent trip, I expected to have my hands (and shoulders) full with extra baggage, so I wanted a bike case with wheels that would make long walks through the terminal easier. Enter the EVOC, which is pliable and packable into a rental car when empty, easy to pack, lightweight, yet with a base frame and wheels for rolling through the terminal. My 10-day trip included five flight segments, starting in Denver and touching down in L.A., London, Geneva, and Washington, D.C., before returning to Denver. 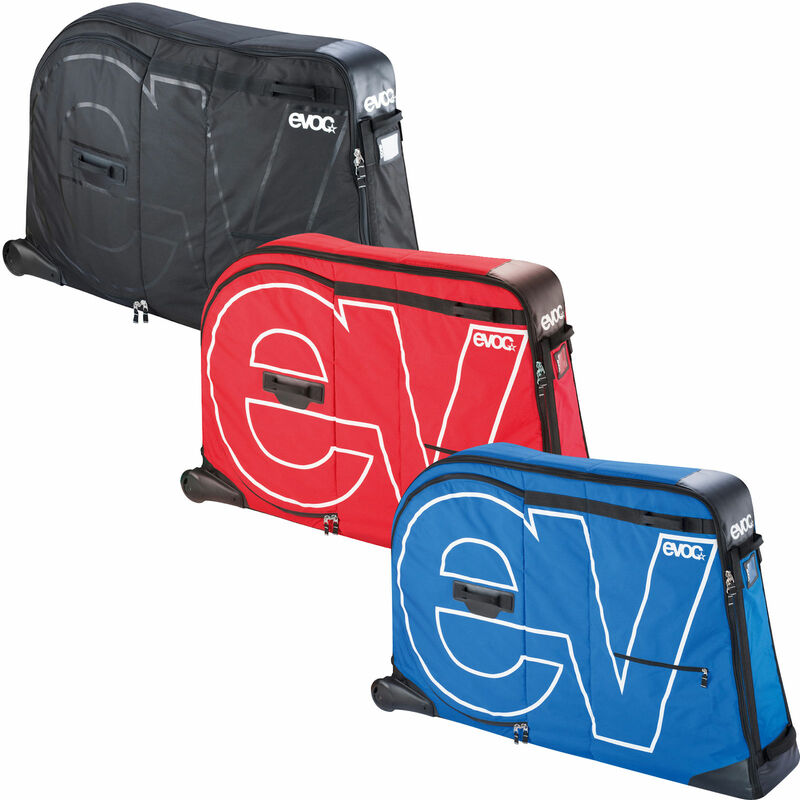 The EVOC bag is meant to accommodate road or mountain bikes with minimal disassembly and substantial protection. Right out of the box, the design and placement of protective panels, internal ribbing and foam padding looked promising. But for me, it’s all about ease (and quickness) of packing, with no compromise in protection. First though there was some preparation involved. To get the EVOC ready to fly, you have to slide PVC tubing into external sleeves. 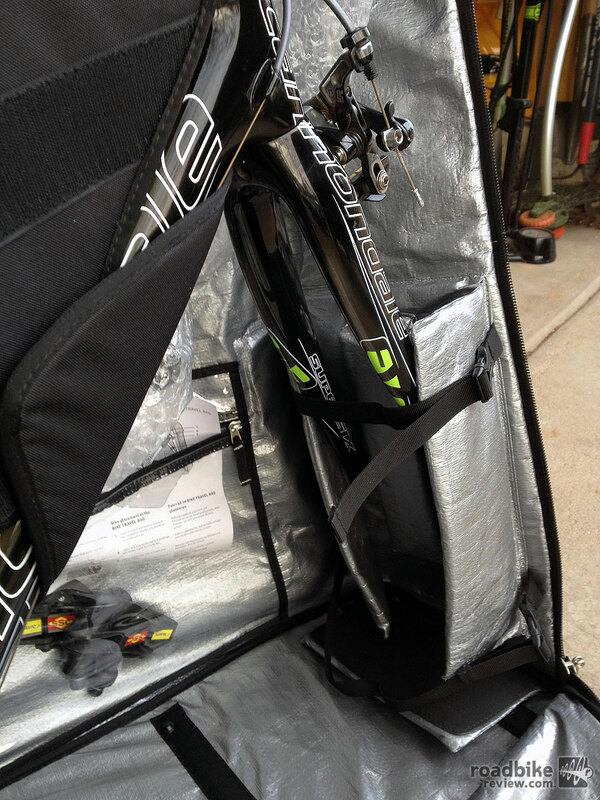 These help the bike case stand on its own for easy packing and protection on the four vertical “corners” of the bag. The included assembly instructions are easy to follow. Once the plastic ribs are in place, the bag stands up perfectly and is ready for packing. The side loading aspect is slick; it feels easy to load this case. There are also many pockets and pouches on the inside and outside of the bag, providing padded slots for almost everything you’d ever want to carry. 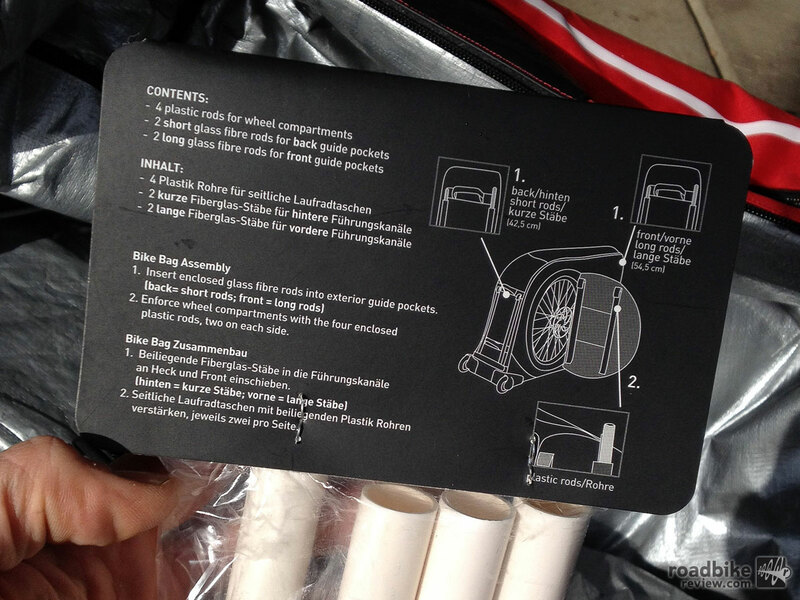 Instructions included with the bag provide tips on how to load your bike. But I have a routine that’s kept my bike safe for frequent air travel. It’s all about pre-prep and careful packing and padding of delicate parts. 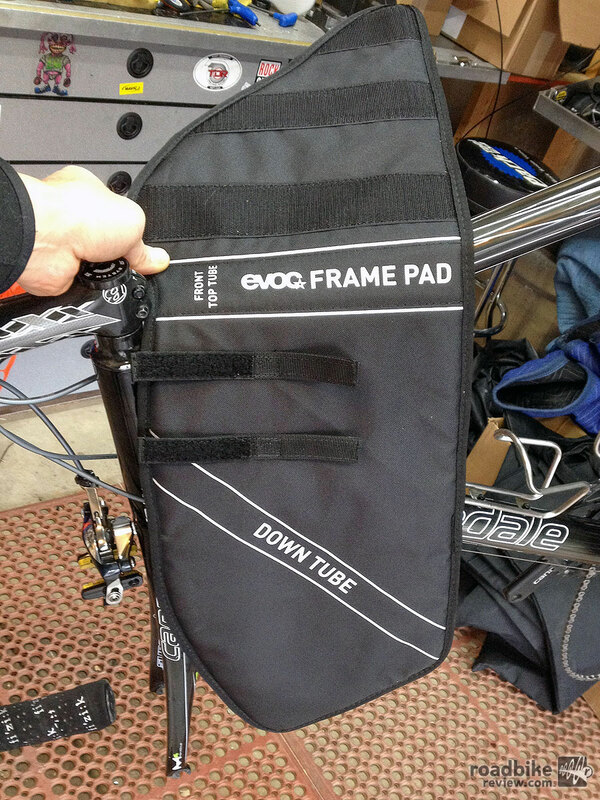 The EVOC case includes extra padding for the frame and has a separate padded pouch for the fork. Packing a bike starts with removing the pedals. This is in the instructions and is required for any packing of a bike, whether it’s into a cardboard box or a canvas travel bag. Next, remove bars from stem. A removable face-plate stem makes this a cinch. The EVOC instructions don’t specify this step, but I’m in the habit of wrapping the bars in bubble wrap and then a pillow case. This ensures that the bars won’t mar the frame or fork when packed. 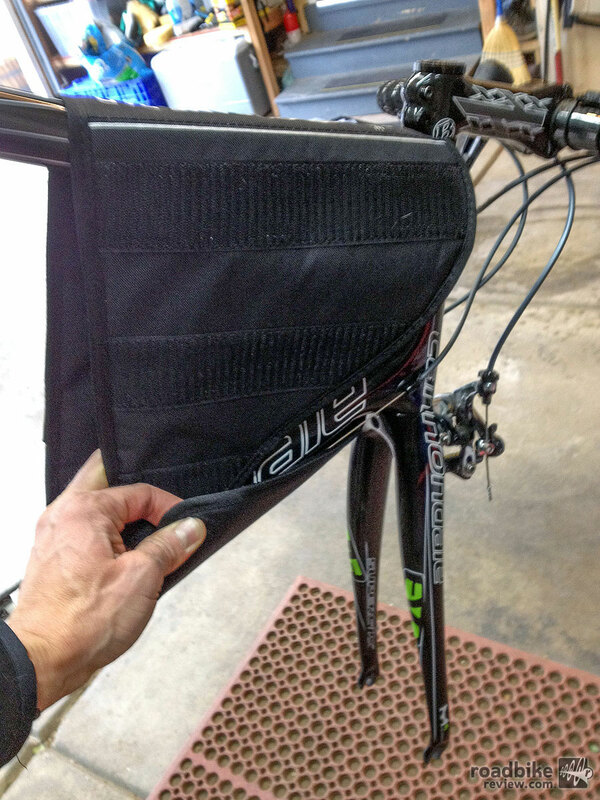 The EVOC bag includes a slick top and down tube protector that velcro’s into place and helps protect the front of the frame from any abrasion by the bars. 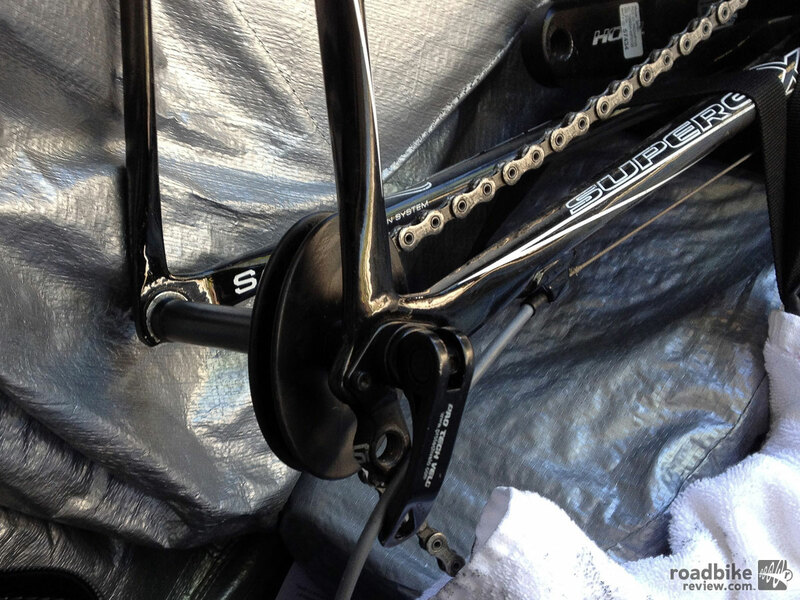 It includes straps to secure the bars if you prefer to fix them securely to the frame. 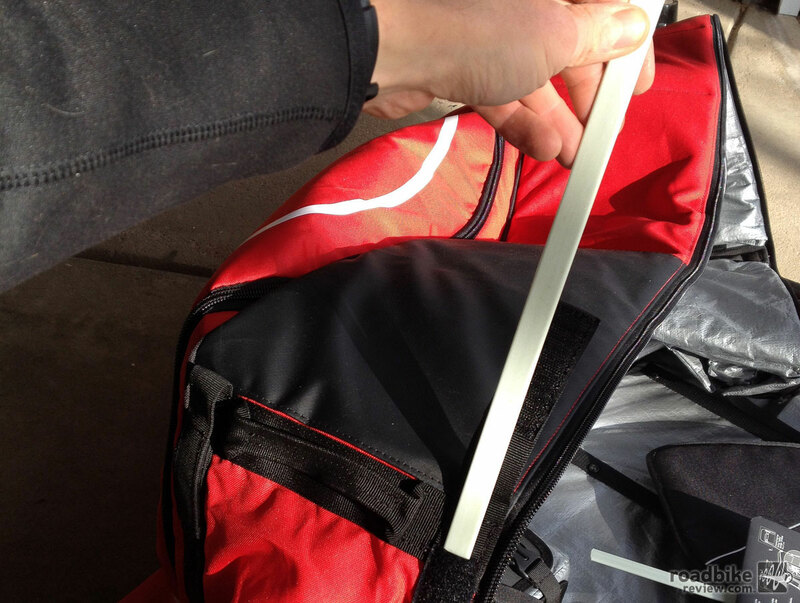 There are also multiple straps and loops on the inside wall of the travel bag. These can be used to hold the bars away from the bike or securely hold other loose parts. But again, padding the surfaces of your bike is a good idea. Extra protection can’t hurt even if it seems like overkill. Of course the wheels have to come off. 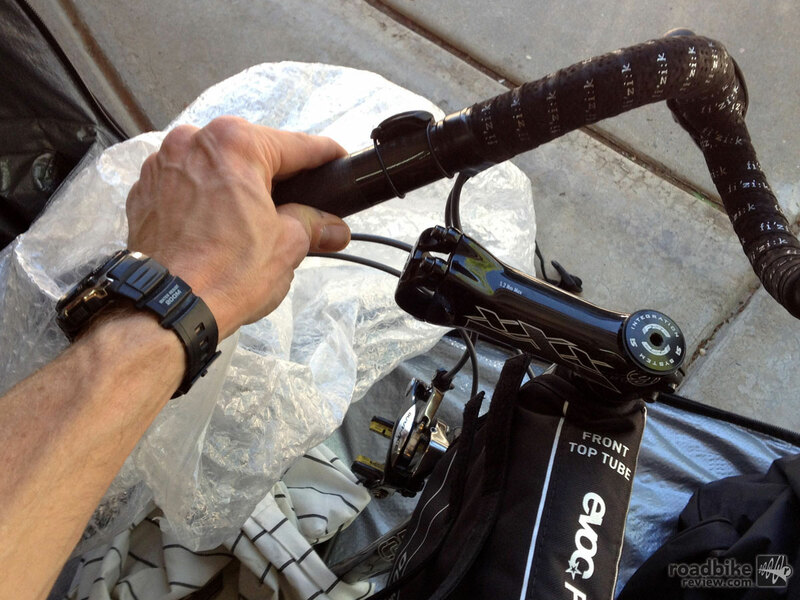 The EVOC bag’s external sleeves for the wheels are adequately padded, but as an OCD bike packer and frequent traveler, I supplement the protection with padded wheel bags. The seat and seatpost must come off as well. For one leg of the trip, I simply loosened the post and crammed it into the frame and the bike still fit fine. However, it was just as easy to take off the seatpost and stuff it in an empty wheel bag. The included instructions say you can leave your rear derailleur in place. But I always remove the rear derailleur and brace the rear dropouts with an axle dummy. 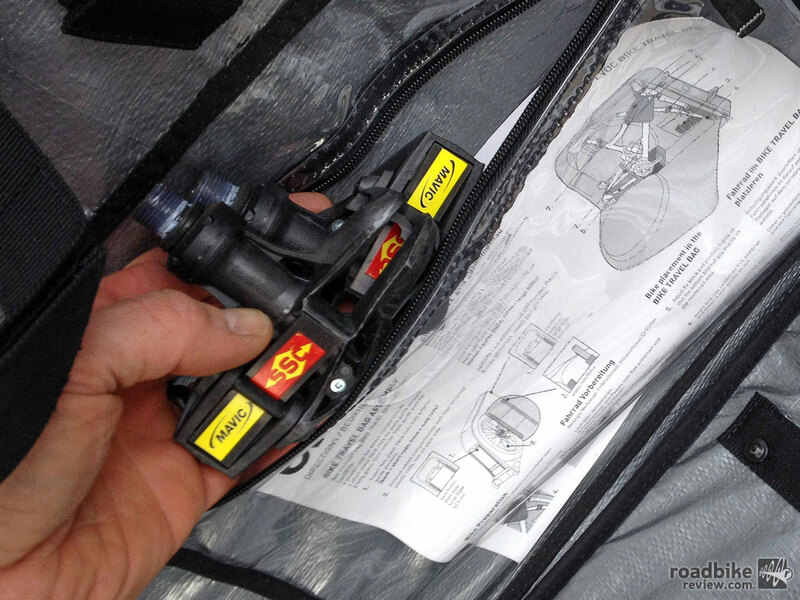 A squished rear triangle or bent derailleur hanger would end your cycling plans in a hurry, and if you have ever watched the bag handlers lay a bike case on its side, you know how easily this could happen. With the bars off and padded, the pedals off and stowed, the wheels off and stowed, and the dropouts protected, it’s time to load everything into the case. Up front, there is a padded and strapped slot for the fork. It’s sized for a MTB suspension fork and there is a padded reducer for a road fork (sold separately). I didn’t have that, so the fit was fairly loose. But it was easy to strap in to keep everything secure. All in all, the bag is nothing if not spacious. You’d be hard pressed to find a bike that didn’t fit. There was ample room for my road bike and it didn’t take any wrestling to get everything secure. Fully packed with all my extra padding, tools, and extra stuff, the case weighed 48 pounds at check in. (Remember, my road bike is 14 pounds.) But depending on your personal level of OCD packing, you could eliminate a lot of the extra padding and shed a little weight. No matter what case you use, you’ll need to remove the bars and pull the pedals. Internal pouches provide ample store space. 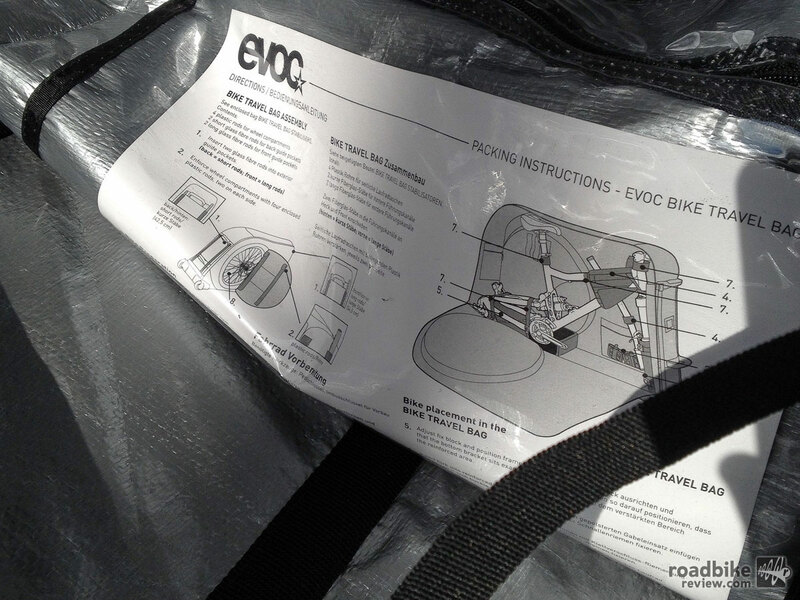 After initial set up and a brief “getting to know you” phase, I was able to pack or unpack my bike in 20 minutes when using the EVOC Bike Travel Bag. And that’s with my extra cautious packing style. If you followed EVOC’s directions, you could slice that time in half. This bag makes the process easier thanks to all the extra internal space, so you can be a little sloppy stuffing the bike in, but still have plenty of wiggle room. 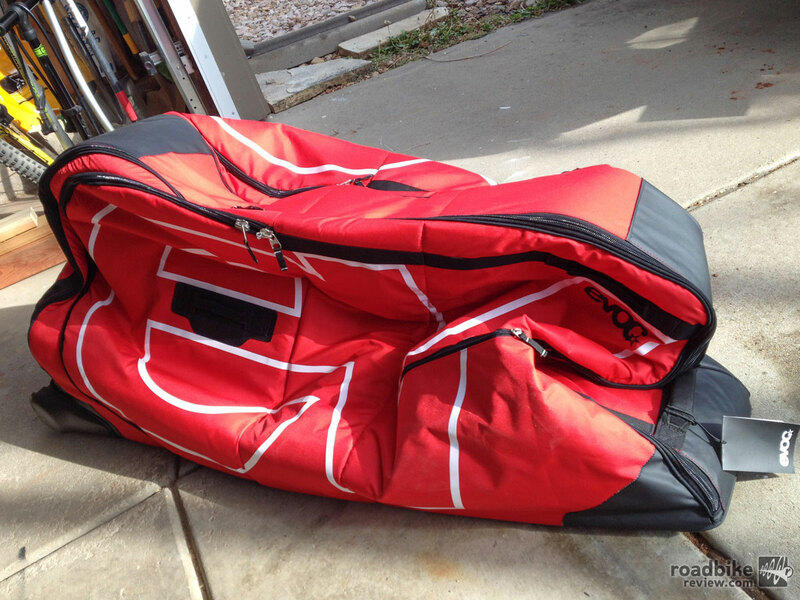 It’s a huge bag that would accommodate most mountain bikes no problem. And once on the road, the wheels make airport navigation much easier than a shoulder-strap bag. The only knock is that if your load is unbalanced, the case tends to list and tip if the load shifts. That just means paying extra attention when wheeling around. Outside the airport, the bag was easy to stuff into a midsize rental car, laying flat in the back seat. 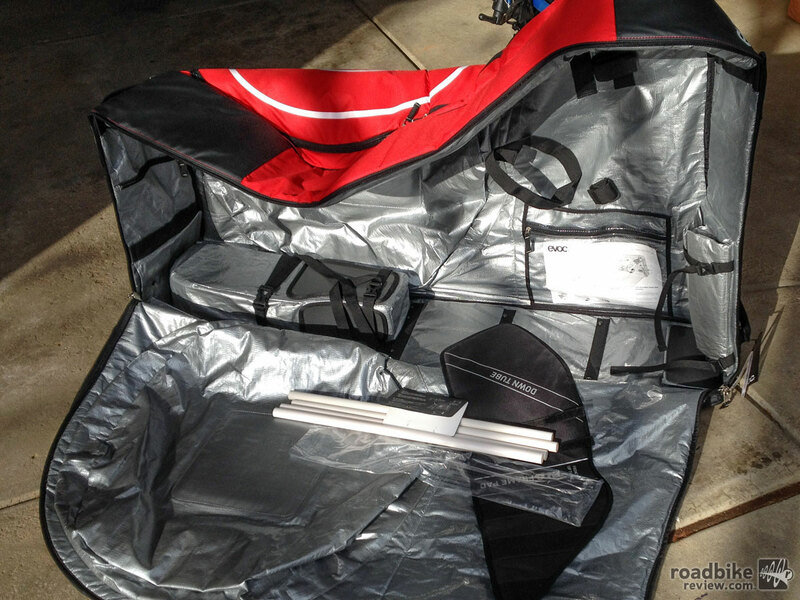 Bottom line, for my frequent travel needs, I’m a big fan of the EVOC Bike Travel Bag and would recommend to anyone who is planning to fly with their bike. Thanks for the great review. 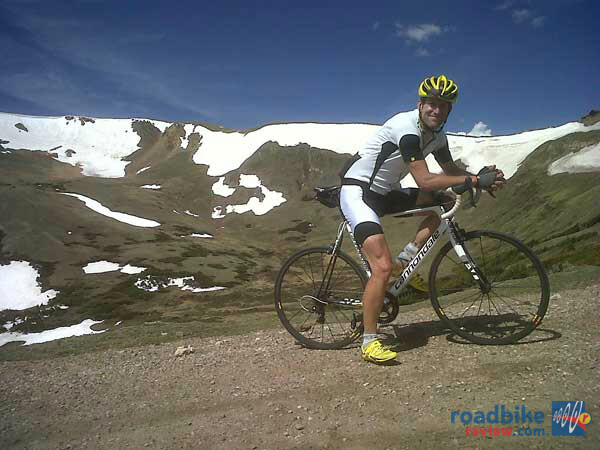 I’ve never traveled with my bike, but I understand that the good life requires me to eventually. Do you pack all of the tools; like a pedal wrench? I ask, since tools can weigh a lot, and since I obviously don’t know.. thanks!